From the 20th of August 2015 meetings are being held in the Filby Village Hall, Main Road at 2.00 p.m. on the third Thursday of each month unless otherwise stated. From 2009 to 2015 meetings were held in the Clubroom, Main Road. From the 15th November 2009 this page has carried the Secretary's monthly report on the institute's activities. the W.I. past reports for 2009 and 2010.
the W.I. reports for 2011.
the W.I. reports for 2012.
the W.I. reports for 2013.
the W.I. reports for 2014.
the W.I. reports for 2015.
the W.I. reports for 2016.
the W.I. reports for 2017.
the W.I. reports for 2018. Linda Palmer thanked everyone who had helped to make a lovely afternoon. June Pratt thanked Sue Smith and Allison Barson for an excellent Trading Stall. Several members attended the A. F. M. Everyone was thanked for the fantastic amount of towels for the Leeway Womens Refuge. A representative from there spoke about the charity which provides specialist domestic abuse advice and support. The second speaker was Louise Chapman 'The lady mole catcher' who spoke about and showed film of hertime in and on Australian TV. She was not catching moles she was involved in much bigger things like snakes and crocodiles. A 5 course evening meal has been organised for 9th Feb at Ambitions at Gt. Yarmouth College. Cost £21 per head partners welcome. Please pay at the January meeting. The monthly meeting was held in the Village Hall on 15th December. After the singing of Jerusalem President Jan Howard welcomed members, 3 guests and speaker Mrs Nana Lay. Minutes of the previous meeting were taken as read. No matters arising. Federation Office are requesting vintage recipes over the last 100 years (without infringing copyright). Norfolk Federation are celebrating 100 years in 2019. If anyone has an item they would like to sell on a 50/50 basis anytime during the year. Please put a price on it and give it to Sue Smith for the bring and buy stall. Members had donated £57.00 instead of exchanging Christmas cards between everyone. Members agreed to make this up to £100 from funds. The money is to be given to the After School Cookery Club at Filby Primary School to put towards a new cooker. May Wanlass is in charge of outings and has booked tickets for the Circus on 29th December and an evening meal at 'Ambitions' on 9th February. The cost is £21.00 for the meal payable at the meeting on 19th January 2017. Our speaker Mrs Nana Lay spoke about her Danish Christmas's at the same time as demonstrating Christmas decorations which we all had a go at making. She had made some delicious Danish cookies for us. Vote of thanks was given by Angela Pacey. After tea, mincepies, stollen and shortbread was enjoyed. A big raffle took place. This was the last WI meeting of member Pam Pritchett who is moving out of the district. Jan Howard wished her well from all of us. The meeting ended with Jan reading out a poem all about friends and wishing everyone a Merry Christmas and Happy New Year. January 19th 2017 2.00pm Filby Village Hall. The Annual Meeting was held on 1st December. After the singing of Jerusalem President Jan Howard welcomed WI Adviser Margaret Collingwood, members, 2 guests and Helen Farman who had brought Fairtrade items to sell. Minutes of the previous meeting were read, approved and signed. No matters arising. May was thanked for organising the visit to 'Ambitions' Restaurant. Harnser Group meeting recently had been very good with Christine Adams talking about, and showing, slides of her 'Incredible Journey'. Instead of exchanging Christmas Cards we are collecting for Filby Primary School to enable them to replace the cooker for the After School Cookery Club where member Sue Smith helps the children. More sets of jumpers and hats were handed in for the babies in Malawi. May took names for the trip to the Hippodrome's Christmas Show on 29th December. Lottery bonus ball winner last month was Cindy. December birthdays are Valerie and Margaret Coe. Official business - The treasurer gave out copies of the Financial Statement and explained items on it. Although we are in a healthy position, fund raising must always be in our minds. The Committee's Annual Report was read by Valerie. Jan gave her President's report thanking everyone who had helped her during the year. Members were given the opportunity to discuss and ask questions about the running of the WI and any ideas they may have. Vote of thanks to President and Committee was given by Stella on behalf of the members. Vivien Moore read out the speakers booked for next year. Ideas always welcome. Margaret Collingwood then took over the official business, Introducing the Committee, who remain the same with the addition of Allison Barson. Members were given voting slips to vote for next year's President. Jan Howard was elected President for next year. Jan thanked everyone and gave a gift to Margaret Collingwood. Before our Afternoon Tea Jan presented Pam Pritchett with a card and photo album made up with all her Filby WI memories compiled by Lyn Ridpath and Jan Howard. Pam has been a member for several years, having been Treasurer and President during some of that time. She is moving back to her home town and will be missed by us all. Pam said how much joining the WI had helped her when first retiring here and all the friends she has made over the years. Our tea was bought in from Elaine's Tea Room in Martham and consisted of delicious sandwiches, savouries and a lovely birthday cake made specially for Chris Martin's birthday in November. A perfect end to a busy afternoon. Next meeting 15th December 2.00pm Village Hall - A Danish Christmas - decoration demonstration. Bring a small pair of scissors with you. Next meeting 1st December 2.00pm Village Hall. This is our Annual Meeting. After the business a free Afternoon Tea will be available. However,if you cancel after 28th November there will be a £3 charge to you for food which had been ordered. Helen Farman will be bringing Fairtrade items to buy as well as our own Bring and Buy Stall. Resolutions to be discussed at the National Annual Meeting next year are in this month's WI Life Magazine. Please bring completed selection form to this meeting. The monthly meeting was held in the Village Hall on 20th October. President Jan Howard chaired the meeting and welcomed members, new member Vivienne Barker and 2 guests. Minutes of the previous meeting were read, approved and signed with no matters arising. Jan was our speaker and gave us the 2nd part of the history of the 'Titantic'. A very absorbing story with many comments from members. Vote of thanks was given by Vivien Moore. Before refreshments a presentation of flowers and a gift voucher was given to Molly Dorrington who is 90 on 29th October. Molly has been a member for many years and was President from 1987 - 1991. Molly read out a poem and shared a beautiful cake with members. In our correspondence we had received a letter and photograph from H.M. The Queen sent from Balmoral to thank us for the 90th Birthday Card and poem composed by Jan Howard. Invitations had been accepted from Gt. Ormesby WI and Nightingales WI. The white ribbon had been written on by Jan and sent to Federation Office for the 'No to violence campaign' being run at the moment. The launch being on 25th November at The Forum in Norwich. Members had enjoyed a look round and had coffee recently at Moulton Nurseries. List of forthcoming events was given to every member. The quiz had been a great success on 1st October and everyone who supported and helped were thanked. Including Quiz Master Stan Ridpath. Lottery Bonus Ball winner was Margaret Coe. Birthday cards were for Elaine Ellis, Janet and Linda. Chris Martin is celebrating her birthday in November and was given a card and gift voucher. Janet and Michael Laxon celebrate their Golden Wedding in October and Janet was given a card and gift voucher. Next outing is to 'Ambitions' on 24th November for lunch. 17th October meet 10.30am at Moulton Nurseries for look round and coffee. 20th October monthly meeting in Filby Village Hall at 2pm. Speaker Jan Howard "Titanic Part 2". 24th November meal at Amibitions Restaurant, 12 noon for 12.30pm. Balance of £10 due at October meeting. Thank you to everyone who came and enjoyed our Quiz Night on Saturday 1st October. Also thanks to Quiz Master Stan Ridpath and to all the Fruit Pie makers and helpers on the night. President Jan Howard welcomed members to the meeting on 15th September in the Village Hall. Minutes of the previous meeting were read, approved and signed. No matters arising. Speaker was Charlotte Philcox 'The wonder of woollies'. Looking at the most unusual and often very funny front covers of vintage knitting patterns from 1940 to 1970. Fashions, make up, hairdos, poses and famous people. She also brought examples of vintage knitted items. Business - members were told that next year's subscriptions would be £39.00 for the year with our WI keeping £19.00, Federation keeping Â£8.80 and National £11.20. Harnser Group meeting is on 26th October at Bracecamp Hall, Ormesby at 2.00p.m. The speaker is Christine Adams 'My incredible journey'. Cost for members £2.00, guests £2.50. Outings - 17th October meet at Moulton Nurseries 10.30a.m. for coffee and look round. 24th November Christmas Lunch at 'Ambitions'. Visit to Christmas Show at the Hippodrome in Yarmouth is to be arranged. Lottery Bonus Ball Winner was Sue Smith. Birthday cards were for Jan, Doreen Thompson, Julia and Amanda. Next meeting is on 15th September in the Village Hall at 2.00pm. Speaker is Charlotte Philcox 'The Wonder of Woollies' (Not Woolworths). Please bring £5 deposit for Christmas Lunch at 'Ambitions'. As mentioned at the last meeting we are making a donation of Sanitary Protection Products to be taken to the AM in Scratby on 20th September for passing onto the homeless Women in Refuges. Items required. Also if you have any good quality handbags, no longer used, which could be sold for Federation funds please bring them along. President Jan Howard welcomed members and 3 guests to the August meeting in the Village Hall. Minutes of the previous meeting were read and signed. Speakers were Mr Mike Cole and Mr Jim Carter talking about 'Crimestoppers'. 'Crimestoppers' a unique crime detection scheme was first launched in Gt. Yarmouth on 24th June 1983 by Peter Ware, Editor of Yarmouth Mercury, in association with, the then, Det. Ch. Inspector Michael Cole and Jim Carter who was the Manager of Woolworths Gt. Yarmouth. The talk was very interesting and there was lots of discussion between the speakers and the members. Everyone was given copies of correspondence and newspaper cuttings of 'Crimestoppers'. Official history claims 'Crimestoppers' began in 1988 established by Lord Ashcroft in conjunction with the Metropolitan Police. but that isnt so. After refreshments correspondence was read out and details were given of the speakers at the Autumn Meeting in Scratby which some members will be attending. Margaret Coe was thanked for hosting the swim and lunch at her home recently which was very good. Members enjoyed the visit to the Museum of the Broads. Unfortunately the Dabble Day had to be cancelled due to lack of numbers. In view of the very sympathetic reaction to Norfolk's resolution about providing sanitary protection products for homeless women. Members were asked to donate items and bring them to the next meeting to be taken to the Autumn Meeting. These will be distributed to the Salvation Army and refuges. Birthday cards were for Kate, Caroline and Liz. Members were asked to bring £5 deposit to the next meeting for Christmas Lunch at Ambitions Restaurant. I have just been advised that, regretfully, this event has been cancelled. Come and enjoy a fun evening to test your general knowledge, Saturday 1st October. Village Hall, Main Road, Filby. Prompt 7.00pm start. Teams of up to 6, family and friends welcome. £10.00 per person to include fish and chips followed by sweet, tea or coffee. Please make cheques out to Filby WI with team name and forward by 8th September to Mrs Sue Smith, Chapel Lea, Main Road, Filby. NR29 3AA. phone 01493 369291. Come and join us on Friday 16th September in the Village Hall, Main Road, Filby from 10.30 to 4.00pm.Open to non members. £10.00 per person to include Ploughmans lunch and refreshments. Dabble in painting, making an item using a sewing machine, weaving with 2 members of the Norfolk Weaving Guild, jewellery, making cards with dried and pressed flowers, knitted flowers and plant propagation. Contact Mrs Lyn Ridpath on 01493 377787 by 10th August. On a very hot day President Jan Howard welcomed members and guest Keith Johnson to the beautiful gardens of member Kate Foster's home. We enjoyed an abundance of strawberries and cream and delicious scones made by Sue and Vivien with cream and home made jams. Jams and pickles made by members were available to buy along with an assortment of plants. The big raffle was for Kate's chosen charity 'Musical Keys'. Lottery Bonus Ball competition was won by Pam Pritchett. Birthday cards were for Pam, Sue, Betty and Shirley. Vote of thanks to members who helped make the afternoon so nice was given by Valerie Brock. Jan Howard presented a voucher to Kate with all our thanks. Jan also gave a voucher to Keith Johnson to thank him for all the hard work taking and printing our photographs. Copies of the photos taken at our last birthday were on show and available to order. Dabble Day - Would you like to join us on our Dabble Day on Friday 16th September in the Village Hall, Filby 10.30 to 4.00pm. Open to non-members. Cost £10.00 to include drinks and Ploughmans Lunch. Dabble in Painting, making an item using a sewing machine, weaving with 2 members of the Norfolk Weaving Guild, jewellery, making cards with dried and pressed flowers, plant propagation and knitted flowers. Phone Lyn Ridpath 01493 377787 by 10th August. 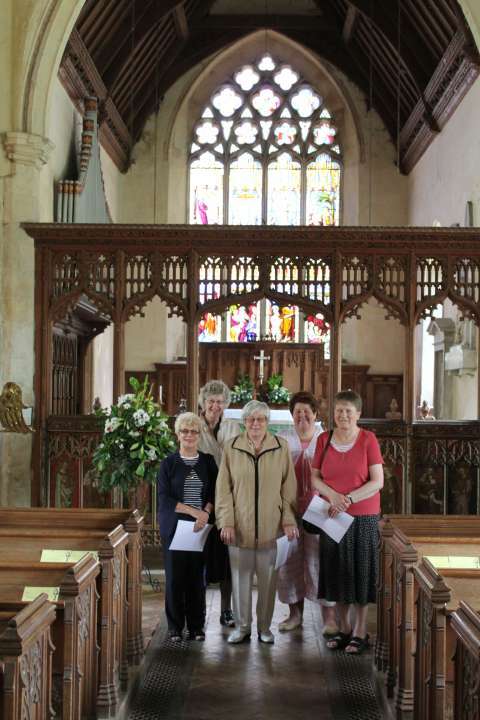 Filby WI had their June meeting in the Village Hall. After the singing of Jerusalem President Jan Howard welcomed members. Minutes of the previous meeting were read, approved and signed. Speaker for the afternoon was Ian Russell MBE who, with the help of slides, talked about how he and a friend started Wroxham Barns and how it has grown into the popular place it is today. He answered several questions from members. Vote of thanks was given by Pam Pritchet. After refreshments our Link Delegate, Filby member Kate Foster, gave her report on the Annual Meeting held in Brighton. It had been a very successful meeting with both resolutions being passed. Dementia care in hospital by 79.5% of the votes and Avoid food waste, relieve food poverty by 82.7%. Both will become WI campaigns. Kate also spoke about Denman College, we had sent a donation towards their appeal, but Denman must become solvent. They have commissioned a survey to inform their actions. All members had been given a copy of Forthcoming events and changes to the programme. The treasurer gave her report. Lottery Bonus Ball was a rollover. Birthday card was given to Sue Dawes. Invitations had been received from Ormesby Nightingales, Neighbours Group and Hemsby and Sth Walsham WIs. Date for Theatre Royal, Norwich visit to see 'The Witches of Eastwick' is 3rd Feb at 2.30pm cost £16.30. 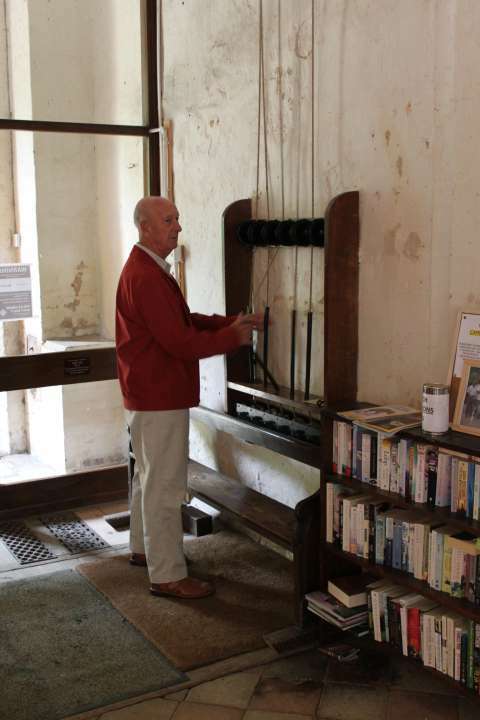 Museum of the Broads visit 19th July meet there 1.15pm. After the singing of Jerusalem, President Jan Howard welcomed members to the May meeting in the Village Hall. She introduced the speaker, Colin Smith, who gave a very interesting talk after which he answered member's questions. Vote of thanks was given by Stella Cotton. Following refreshments the business took place. The November AGM has been changed to 1st December. This means there will be 2 meetings in December. There was a request for unwanted Bras to be used for a Federation Competition 'Hanging Braskets'. These are to be filled with compost and planted. Hopefully to make a colourful display at our Garden Party. Kate Foster presented the 2 resolutions for discussion. 'Avoid food waste, address food poverty'. This was passed. 'Appropriate care in hospital for people with dementia' was voted against with several abstentions. The next outing is to Museum of the Broads at Stalham on 19th July. Names were taken for the Autumn Meeting at Scratby on 20th September. Birthday cards were for Stella, Margaret and May. Next meeting 19th May at 2.00pm in the Village Hall. Another interesting talk by Colin Smith. This is also the resolutions meeting when we will discuss the 2 resolutions 'Avoid food waste, address food poverty' and 'Appropriate care in hospital for people with dementia'. President Jan Howard welcomed members and guests from local WIs to Filby Village Hall on 21st April. We were celebrating the 82nd birthday of Filby WI and the 90th birthday of HM The Queen. The hall and tables were decorated with flags and happy birthday bunting. A table was laid out with lots of pictures from magazines and newspapers of the Queen and her family. A rolling DVD of pictures of the Queen as a baby and up to date, compiled by Derek Nicker, was shown on the big screen before and after the speaker. The speaker was Mrs E Scott who dressed up as a Kitchen Maid working at Blickling Hall in 1937. She was very good telling us about the life of a Kitchen Maid and about the family she served. Afterwards, with the help of her husband, Mrs Scott showed slides and talked about the gardens at the Hall and the events they have at the Hall. A small amount of business was dealt with. The Harnser Group meeting had been very interesting with Kathleen Dennett telling us about Costumes for the Stage and bringing examples with her she had made. Fund raising: forthcoming events at Filby WI are Dabble Day on 16th September cost £10 including Ploughmans Lunch and a Quiz evening with Fish and Chips and a sweet £10 each. Tables of up to 6 people. Before the Afternoon Tea, Jan proposed a Toast to the Queen. A lovely selection of sandwiches, cheese scones, plain scones and jam and assorted small cakes with tea or coffee were enjoyed. There was a table quiz with a royal theme for everyone to take part in. A big raffle was drawn. Lottery Bonus Ball winner was Chris Martin. Birthday cards were for Janice and Diane. Jan thanked everyone for their help in making the afternoon a success. The afternoon ended with everyone singing Happy Birthday and God Save The Queen. Harnser Group Meeting, Bracecamp Hall, Ormesby. 2.00pm 20th April. Speaker Kathleen Dennett 'Costumes from the Stage'. Members £2.00, guests £2.50. 21st April Filby Village Hall. Members only. Celebrating the Queen's 90th birthday and Filby WI's 82nd birthday. Meet 1.30pm for 2.00pm. Speaker Mrs E Scott, 'Living History of Blickling Hall' followed by Afternoon Tea and Quiz. After the singing of Jerusalem Vice President Lyn Ridpath welcomed members to the March meeting. Minutes were read, approved and signed of last meeting. Matters arising nil. May Wanless was thanked for organising the visit to Ambitions Restaurant. An excellent meal was enjoyed by all. Speaker for the afternoon was Robert Ferguson talking about and showing slides of 'Conservation in Africa'. A very topical subject as Prince William had been at a Conference this week talking about the same thing. Our speaker was very interesting and answered several questions after his talk. Vote of thanks was given by Molly Dorrington. Following refreshments correspondence was read out. Invitations had been accepted from Winterton and Caister WIs for their parties. Invitation from Rollesby to join them in a visit to Caister Lifeboat Station and a Coffee evening to raise funds for 'Horsey Seals'. A coffee morning to raise funds for the new Ormesby Evening WI was mentioned. 2 people are going to walk round Blicking Hall on 28th April to raise funds for ACWW. Catfield WI are having an Open meeting on 6th April. The speaker will be Mrs Norton from Norton Dairies talking about her farm. Our Harnser Group meeting is at 2.00pm on 20th April at the Bracecamp Hall, Ormesby. A change of speaker now Kathleen Dennett talking about and showing Costumes from the Stage. Entry £2 for members of the Group and £2.50 for guests. Please support this afternoon. The treasurer told members how their yearly subscription is split between ourselves, London office and Federation Office. Lottery Bonus Ball winner was Elaine Henwood. Birthday card was given to Tricia Gillett. President Jan Howard welcomed members and one visitor to the February meeting in the Village Hall. Speaker for the afternoon was Helen Farman talking about Fairtrade and 21st Century Slavery. Her talk was very thought provoking. Kate Foster gave the vote of thanks and said if we all went over to one product from Fairtrade we would help. Helen had items for sale. The business took place after tea and cakes provided by Diane Smith which raised extra funds. Members were asked if they had cake stands which could be borrowed for our Afternoon Tea. Bring to next meeting. Catfield WI have invited us to an Open Meeting on 6th April when the speaker will be Mrs Norton from Norton Dairies. Kate asked for helpers to do the WI Flower Bed on the Pound with her. Lyn Ridpath showed the Thank You Certificate from Mary's Meals. We had sent 32 filled Back Packs for the project. On show were the beautifully knitted Matinee Jackets made by members and Filby Craft Club for the Family Partnership Project. Members were asked to give ideas for outings to May. Lottery Bonus Ball Winner was Angela Beeston. Birthday cards or posies were for Vivien, June, Ann, Allison and Helen. Next outing is to Ambitions on 11th March. The meeting ended with Jan reading out a poem. Next meeting 18th February 2.00pm in the Village Hall. Please note we have been informed that the electricity will be off that day. Please come with extra clothing and bring your own drink. Change of speaker - now Helen Farman talking about 'Fairtrade and 21st century slavery'. Money required for payment of meal at 'Ambitions' 11th March if not already paid. All tickets have been received for the Annual Meeting in Norwich. Please pay Lyn £10 for your ticket. Vice President Lyn Ridpath welcomed members and new members Shirley Thornton and Allison Barson to the January meeting in Filby Hall. The meeting started with the singing of Jerusalem. Minutes of the previous meeting were taken as read. May Wanlass was thanked for organising the visit to Gunton Hall Holiday Park before Christmas and for getting the tickets for the forthcoming 'Sunset Boulevard' at the Theatre Royal. Speaker was Jonathon Smith talking about and showing slides of 'Gory tales of wicked walks round Gt. Yarmouth'. Vote of thanks was given by Betty Burchell. Invitation from Rollesby for their party in March was accepted. The John Grooms 'Noah's Ark' project will be on display in the Forum between 1st Feb and 5th March. We have been asked to knit matinee jackets for new babies of young Mums being cared for by the Family Partnership. We did this in 2013 along with other local WIs and it was a great success. A donation has been given to the Parish News towards their expenses. Also donation towards retirement gift for Cindy Brooks the Fed. Secretary. £82.55 commission was raised through orders in the Webb Ivory Catalogue. Vivien Moore was thanked for doing all the necessary work. Jan, Vivien, June and Elaine have passed their Food Hygiene Certificates. Kate Foster gave very informative information about the 8 resolutions after she went to a meeting at Mattishall recently. The one with most votes was 'Avoid food waste-address food poverty'. Our vote will be passed to Fed. for them to collate all the Norfolk votes to send to National for discussion at the AM in June. Birthday posy was for Elaine Henwood and cards had been sent to Angie and Rita. Outings - 11th March a 3 course lunch at 'Ambitions' Restaurant at the Gt. Yarmouth college. Happy New Year to all. In 2013 Filby, other local WIs and Filby Craft Club were asked to knit matinee jackets for babies born to new young Mums being looked after by the Family Partnership Scheme. Such a wonderful collection of jackets was made that we have been asked if we would like to do the same thing again now for new babies expected. 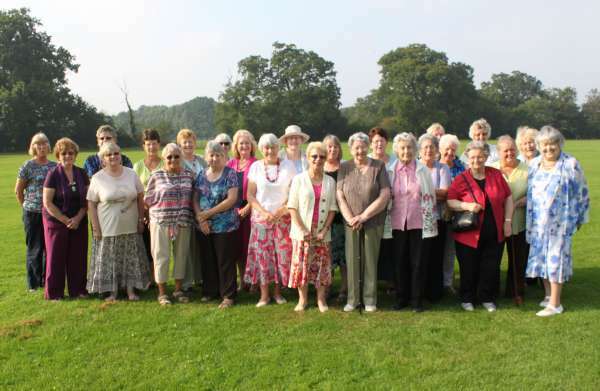 Please let Valerie Brock, Secretary Filby WI, on 01493 720014 know if your WI would like to join in again. Thank you. 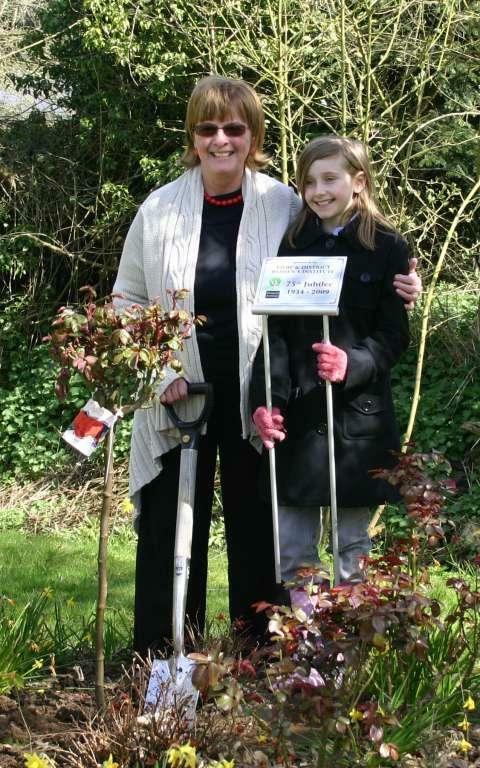 On the 8th April 2009, to celebrate the 75th birthday of the Filby and District W.I., a red standard rose bush was planted in our flower bed on The Pound by President Jan Howard. The occasion is commemorated by a plaque placed in the bed by Filby in Bloom. President Jan Howard with Sasha Lake and the plaque. 48 red geraniums were also planted in the bed. 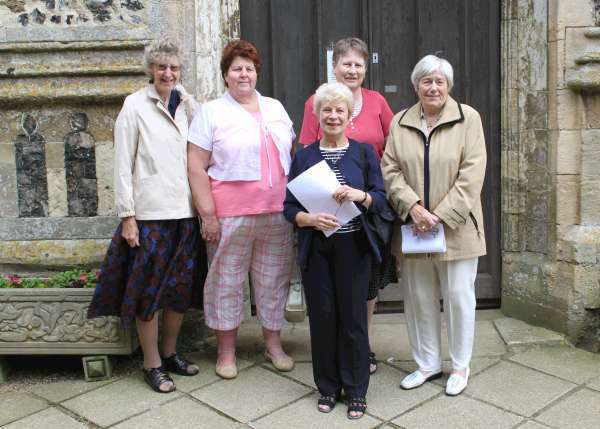 On the 17th June 2009 a group of members met at All Saint's Church, Filby to hear a peal of bells, rung by Geoff Pritchard, to celebrated the 90th anniversary of the founding of the Norfolk Federation of Women's Institutes on this date in 1919. Geoff Pritchard rings the bells. 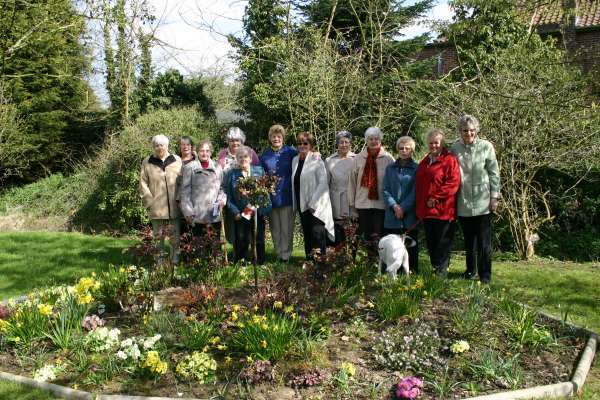 At 2.15 p.m. on the 7th May 2009 members met at the Unitarian Heritage Site, Thrigby Road to visit the orchard and see the progress of the trees adopted by the members.